The Isle of Man is a British Crown dependency in the Irish Sea between Ireland and Britain. The island has a population of 85,000 and is also called Mann. The adjective for Mann is Manx. Flag of the Isle of Man featuring the triskelion. Mann was originally inhabited by Brythonic Celts who came from Wales, but immigration from Irish and Scottish Gaelic Celts gave it its current local language. In the 9th century, Vikings started arriving on Mann. 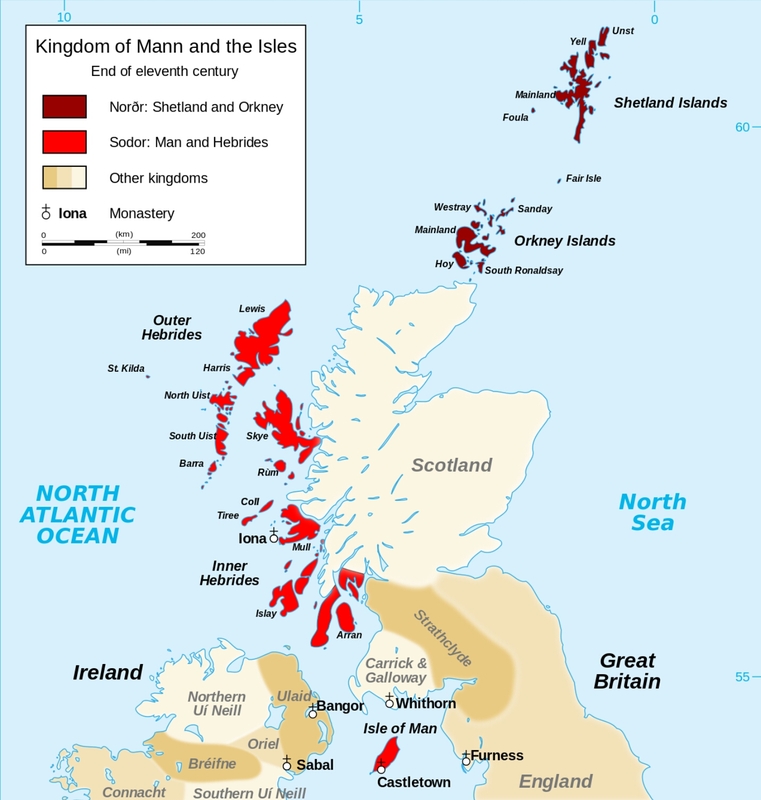 The Kingdom of Mann and The Islands was a Gaelic Norse kingdom that included the Isle of Man and many of the Scottish Islands. 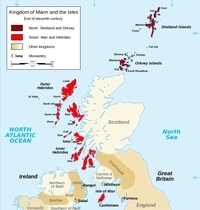 It existed from 1076 until 1266, when Mann was ceded to the Kingdom of Scotland. After many wars the Isle of Man became English in 1346. For many centuries it was ruled by the Stanley family. The British Crown bought the island 1765, and since it has been a Crown dependency with a local parliament named Tynwald that dates back from medieval times. The Kingdom of Mann and The Islands (1076-1266), showing the location of the Isle of Man between Ireland and Britain. The Isle of Man became a popular tourist destination in the early 20th century, but lost that position from the 1970's. Instead, financial offshoring and the sale of coins and stamps have become important sources of revenue. It is also the venue for one of the most spectacular but dangerous motor cycle races, the Manx TT. In the 11th century, coins were minted on Mann that resemble Irish coins of the time. Purely Manx coinage started with private issues in 1668, at par with English coinage. In 1692 the coins from Mann were debased by 16/15, which made an English Crown worth 5 Shilling 4 Pence in Manx coinage. Manx coins were devalued further to 14 Pence per English Shilling in 1696. The coins from Mann were so similar to English coins that they were used to pay in England at nominal value, making a 16% profit. To stop this practice, the Manx currency was reformed to be equal to British Pounds in 1839 with older coins losing their value. It was the last year that regular pre-decimal Manx coinage was minted. In 1971 the Isle of Man followed the UK in decimalising the Pound, and resumed producing Manx coinage at the Royal Mint with the same specifications as UK decimal coinage. Since 1976 Manx coinage is minted at the Pobjoy Mint, who are trying to maximise profits by regularly changing coin designs and issuing a ridiculous amount of non-circulating legal tender. There are a few dozen circulation types with various themes, but over a thousand NCLT's with the island's name on it. Pobjoy Mint Ltd from March 24th 2017 will no longer represent the Isle of Man as the official minter of Isle of Man legal tender products.